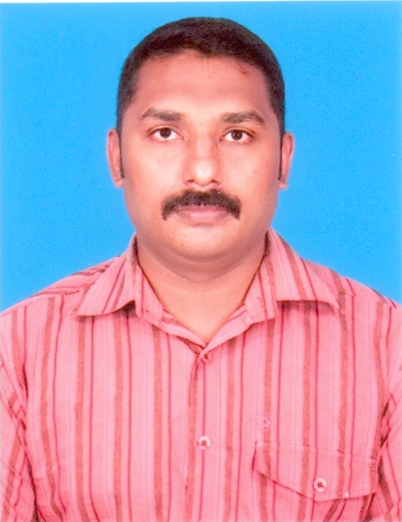 Only the following clauses of the DUPLICATE command are supported: NORESUME, DB_FILE_NAME_CONVERT, SECTION SIZE, and USING COMPRESSED BACKUPSET. The following clauses of the DUPLICATE command are not supported: SPFILE, NO STANDBY, FARSYNC STANDBY, and LOG_FILE_NAME_CONVERT. 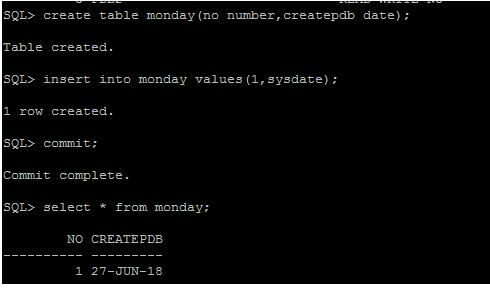 Duplicating a PDB to a CDB that is a standby database is not supported. 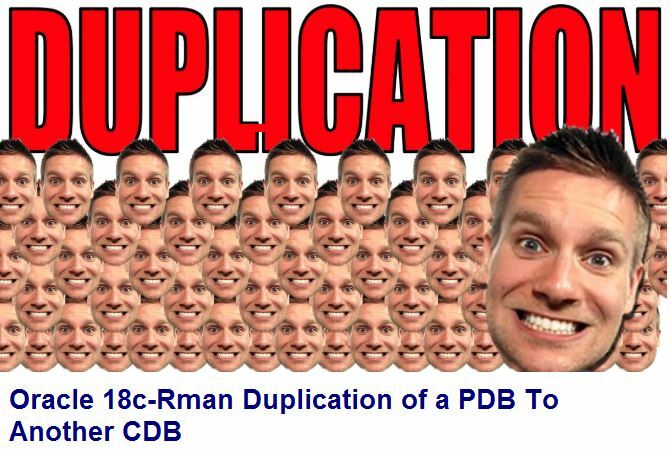 Only one PDB can be duplicated at a time. Partial PDB duplication is not supported, only complete PDB duplication is supported. For example, you cannot include or exclude specific tablespaces while duplicating a PDB. Duplicating a non-CDB as a PDB in an existing CDB is not supported. 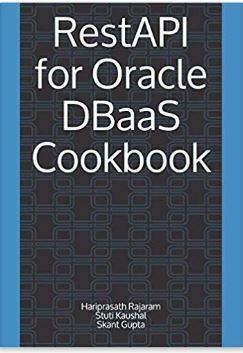 Duplicating PDBs that contain TDE-encrypted tablespaces is not supported. 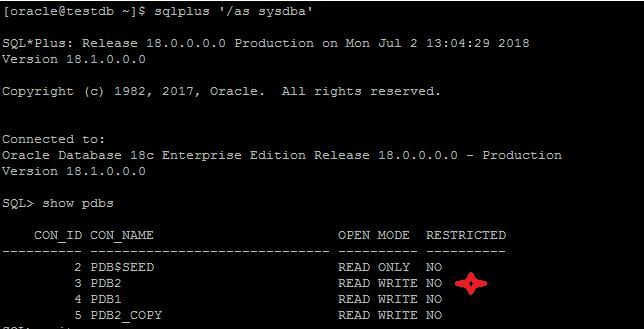 Copyright (c) 1997, 2017, Oracle. All rights reserved. Step5:-Ensure that the destination CDB is open in read-write mode. 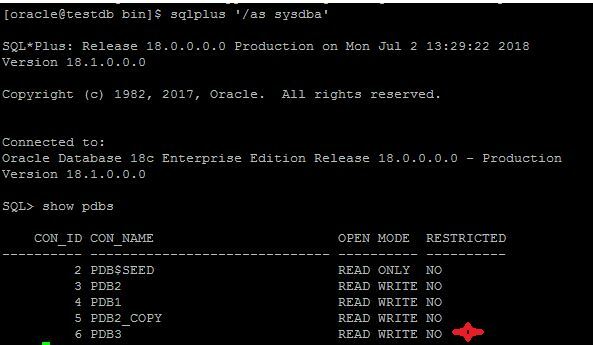 In this article we are going to see Oracle 18c-DBCA PDB Clone. 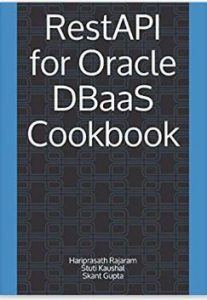 The source CDB is a single-instance database with the SID TESTDB. The source PDB is pdb2. You intend for pdb2 to remain open during the cloning operation, which means that local undo and ARCHIVELOG mode are enabled in the CDB. Otherwise, DBCA closes the PDB during the clone operation, and after receiving confirmation, opens the source PDB in read-only mode. The new PDB is pdb3. Pluggable database "pdb3" plugged successfully. 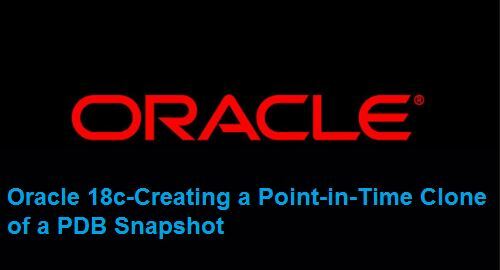 In this article we are going to see Creating a Point-in-Time Clone of a PDB Snapshot. 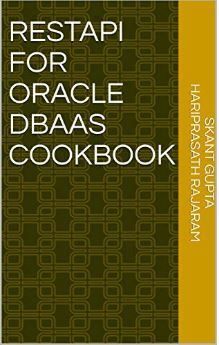 Oracle Database 18c brings an excellent functionality which can be clearly used to create new non-productive environments based on a point in time of our production PDB, as well as having an immediate restoration point in front of a massive load, a pass to important production or other activity that could affect our productive system. 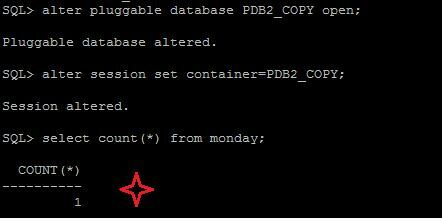 Step3:-Going to take snapshot of pdb2 database. This is a repository for periodic point-in-time copies of a PDB. 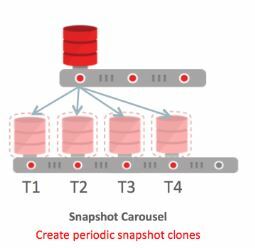 The Snapshot Carousel is ideally suited to development environments that typically require multiple copies of databases at different points in time, or to augment a non-mission critical backup and recovery process. The refreshable PDB switchover capability enables the creation and maintenance of replicas on a per-PDB basis with only two CDBs to manage. simplifies PDB provisioning operations in high availability configurations, protected by Data Guard. Changes to Lockdown Profiles are now dynamically propagated to all applicable PDBs, without the need to restart either PDB or CDB. A CDB Fleet is a group of CDBs managed collectively. This further extends Multitenant’s operational efficiency advantage: In a CDB, we can manage many PDBs as one. Now, with CDB Fleet, we can manage many CDBs as one! Create snapshots manually or automatically, and set the maximum number of snapshots. This version allows us to maintain up to a maximum of 8 snapshots per PDB, once this number is reached,these will be overwritten as new instant copies are required. Snapshots can be configured automatically (executed from time to time) as a manual. For example, while the production PDB named pdb1_prod is open and in use, you create a refreshable clone named pdb1_test_master.You then configure pdb1_test_master to create automatic snapshots every day. When you need new PDBs for testing, create a full clone of any snapshot, and then create sparse clones using CREATE PLUGGABLE DATABASE … SNAPSHOT COPY.